Its been a while since my family and I have been on a vacation, so we made a plan to take a short break in UAE. 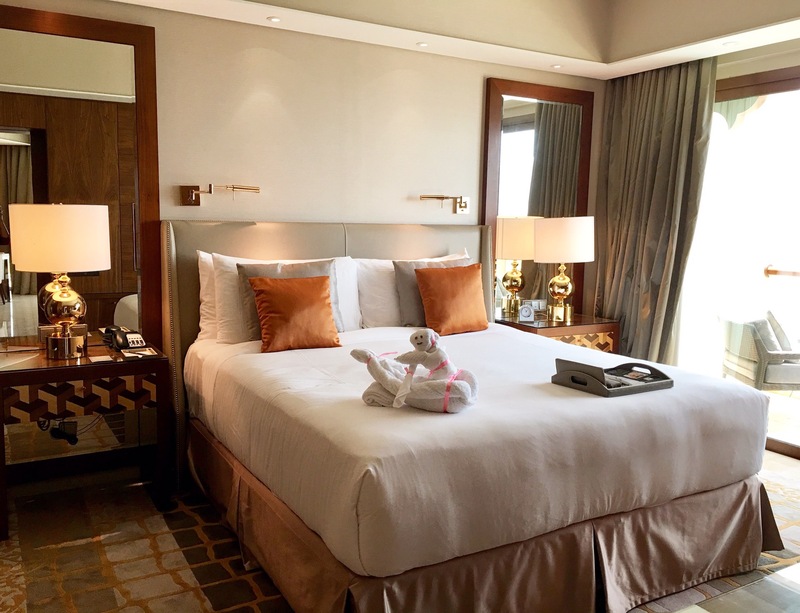 We decided to have our weekend getaway at the gorgeous palm-lined Ajman as it is just 30 minutes away from Dubai and perfect for a relaxed getaway from hustle and bustle of Dubai’s hectic city life. We chose Fairmont Ajman, for its great location, pristine blue waters with white sand and strikingly beautiful views of the Arabian Gulf. This luxurious beachfront property is located in Sheikh Humaid Bin Rashid Al Nuaimi Street and very close to both Sharjah and Dubai. 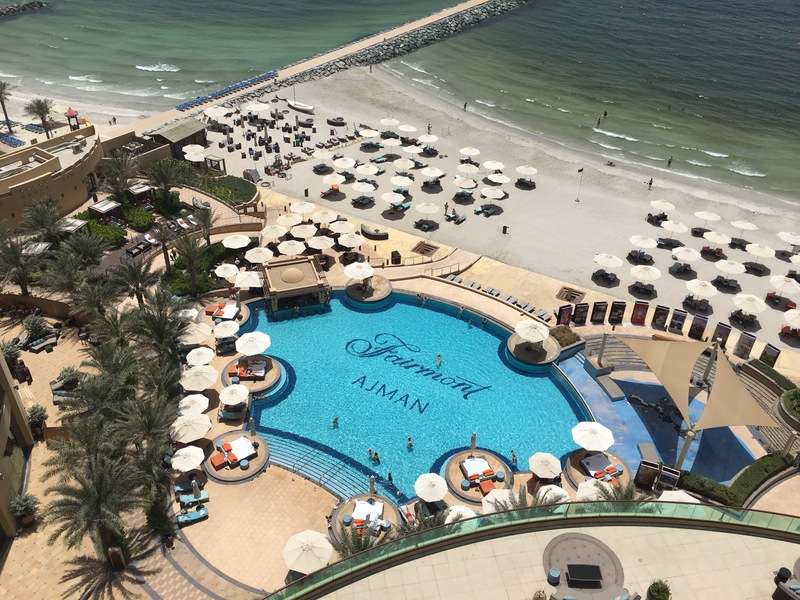 Fairmont Ajman is a perfect spot for a short or long getaway for couples, families, business trips and solo travelers. Fairmont Ajman has a sleek and stylish architecture. It has a contemporary design with a touch of Emirati heritage. You can expect warm and generous hospitality. The check-in and check-out went very smoothly and it hardly took time. The Lobby of the resort is spacious and beautiful. The decor is done up in the hues of blue and white and looks regal. The magnificent crystal chandeliers adds grandeur to the place. 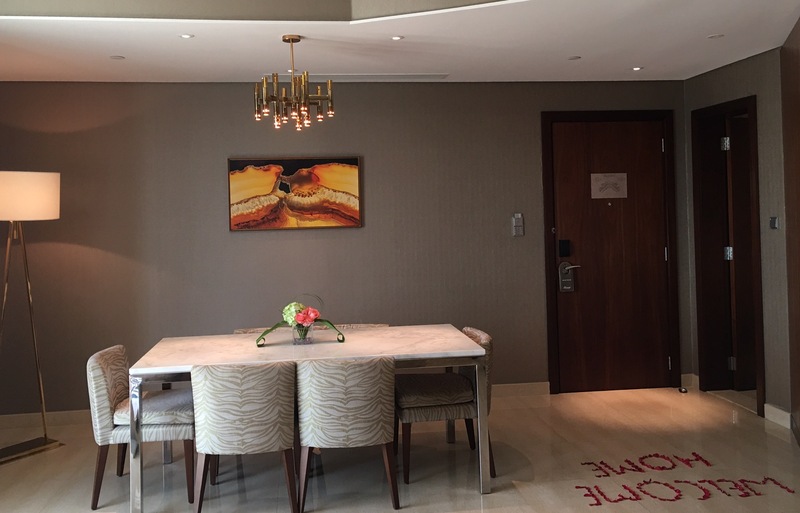 Fairmont Ajman offers 14 floors of accommodation, and they have 252 guest rooms and suites ranging in different size and style. But for a family getaway, one of the best option is their one-bedroom suite. My family and I stayed in their one-bedroom suite. Our spacious and expansive one bedroom suite had a separate living room, bedroom and 2 balconies. 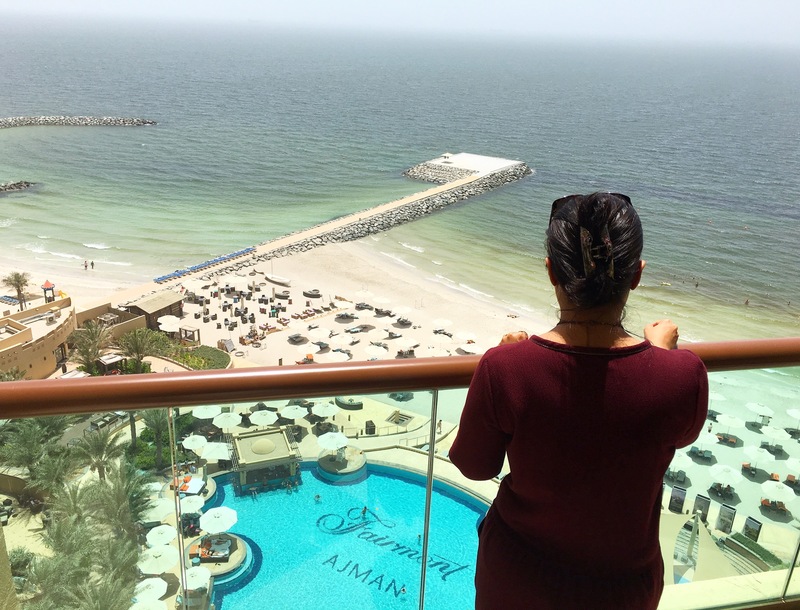 The best part was the unobstructed and stunning views of the Arabian Gulf and the gigantic swimming pool. 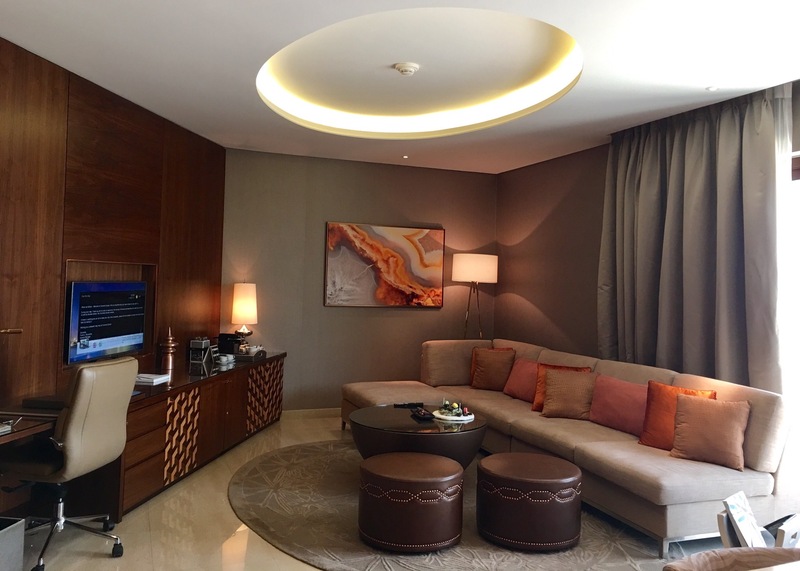 Our luxurious suite had modern decor with plush furnishings and cool marble flooring. A perfect haven for a comfortable and relaxed stay. We loved the way they added a personal touch to our suite by writing a special note ‘Home Sweet Home’ with rose petals on the floor. It made us feel at home. The personalized welcome platter with sweet treats was highly appreciated by my family. Our favorite part in our suite were the 2 balconies with outdoor furniture, where we spent hours together watching the beautiful view. As the resort has a private beach, we would spend our evening lying on the hammock and watching the sunset. It is the best place to soak up the sun, sand and sea. Fairmont Ajman offers 8 restaurants and bars. We visited Spectrum their international cuisine restaurant,for breakfast, Salt & Sea, their swim-up pool bar for lunch and Gioia an Italian restaurant for dinner. We enjoyed our dining experience at all the restaurants that we visited. Apart from the above restaurants and bars, there is Kiyi Turkish Restaurant, Badr Lounge, Azrak Lobby Lounge, XOLO Bar and Driftwood Beach Bar. We also visited their Al Fayruz Ramadan Tent for Iftar. 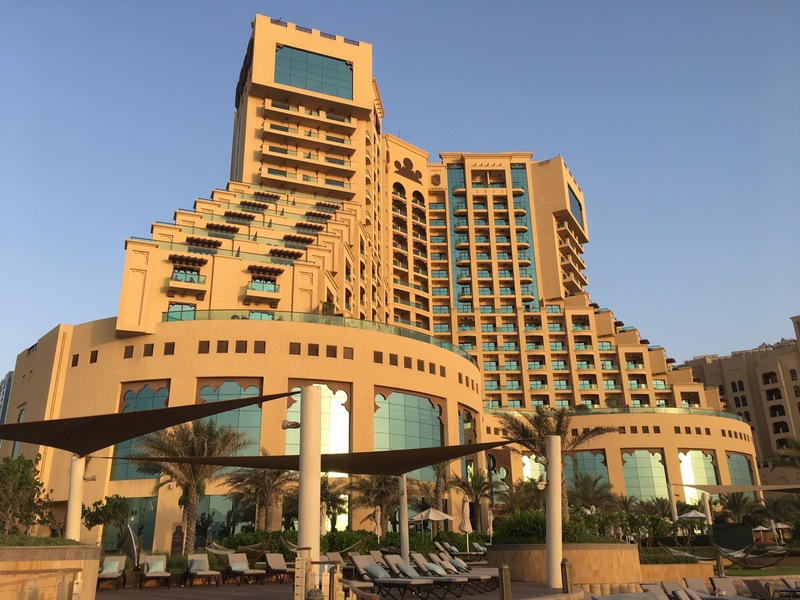 Fairmont Ajman offers extensive facilities like private beach, expansive Infinity pool, sun loungers & cabanas, water sports, kids club, gym, steam & sauna rooms, spa, tennis court, meeting rooms and banquet halls. We didn’t even realize, how our weekend passed. We had a fabulous and unforgettable stay. It was one of the best family staycations. 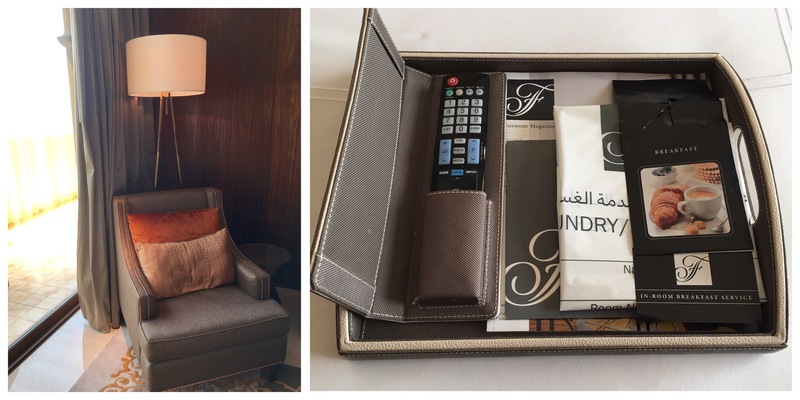 Whether you are a tourist or a resident, Fairmont Ajman is the perfect destination for a relaxed and lavish stay.